Looks like Express35 Changed their handle design so it functions more like the Cinevate handle. 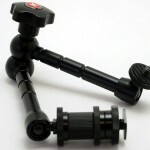 So you might be able to find a more affordable option elsewhere or just use the Cinevate handle. Friction monitor arms for a top handle, who knew? Check out this simple yet efficient rig. Fairly expensive but a truly solid baseplate. If you plan on building out larger rigs this thing is build for larger work horse uses, as well as simple minimal setups. 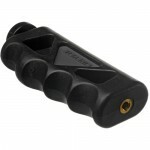 Really nice grip and can be used on 15mm rods. This is the grip you saw at the beginning of the video above. This grip is a little more affordable than the Express35 one. And it has a 1/4″ male thread for accessories. Love it. I have been using the Cheesycam knock-offs to swap camera between rigs, tripod, and other mounts, but this is definitely the most pain-free top-handle I’ve seen. Amazingly simply idea, I have everything needed to make it too, love not needing to spend more money! Sidenote, you need to cut down your videos! Or at least start with a break-down of what you are talking about! I’m about 6 minutes in and I can’t tell if there is going to be any more info that I’m interested in or if it’s just showing viewers what each component does. Great concept and execution again! Awesome Caleb, I am going to have to create this “Caleb Pike” rig! Love it. Glad to hear you can save some dough! Noted. I do need to get things cut down. Thanks. Unofficial dubbed, “The Pike Grip”? I dig it. Awesome rig concept! Defiantly going to be making something like this, also wheres the best (cheapest) place for getting the 3/8 to 1/4 inch adapter? and if its compatible with the manfrotto plates. Its the one I use for all my equipment, but im looking at getting a manfrotto monopod soon and was curious if they would fit. I agree with Caleb’s comments about rigs being as small and flexible as possible. Nice work, Caleb! Insightful stuff. This is a great project. I like the Express35 set-up better. But $60 bucks is out of my handle budget. i have these type of bike handles. Could you please measure the dimensions or the aluminum mount the handle is attached to? It would be a pretty easy DIY to cut a small block of aluminum, and tap a 1/4″ hole. I do like that you could add a very short 15mm rod to the side and attach something else. This is a very practical set-up. And all these pieces have other uses if you want to reconfigure. I’m getting in a Gini Follow focus with rails soon. I wonder if the arm can be used or will it conflict with the follow focus? We will see. Thanks for a GREAT project. I am actually out for the weekend but you should be able to get a block large enough and just drill your holds and tap for a screw to tighten down the handle and to attach it to the rig. Just make sure its strong enough. Hay Caleb great work. Is it me or does the Express35 handle on there website look different to the one you have in your video. Looks as though the arm would attach from the front? I just got that friction arm and love it. Thanks. I don’t like how hard it is to tighten the baseplate because it hits the camera like you said. So I’m going to make a little riser out of 3/4 oak. Cut it to the same size as the Manfrotto baseplate, countersink a 1/4 20 t-nut on the bottom, then screw the baseplate on top of it. The plate from the tripod will attach to the t-nut. Thanks again! For a lower budget, you can also use this handle. For sure, it’s not good as the express35, but it’s only 8$ and it works well. It has a 1/4 mount underside. 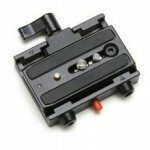 would that cinevate plate fit on a t2i without blocking the battery door? has anyone tried it? Hmm. I wouldn’t know. Any T2i folk know the answer to this? Not sure about the Cinevate with the T2i. But I use a battery grip and you access the batteries from the side. I made that oak riser and painted it black, works great. Like it very much. Hope to use it soon. Especially after shooting with my rig for a day yesterday. It lookes lite but it isnt. Do you know the monfrotto 394 quickrelease. I chose that as my system for switching stuff. After use i found it a bit clucky and even worse pretty heavy and high. Its the Nikon mount Tokina. Its ok. Cheap, lens front does not most (great for matte box use) but its a little soft @2.8 and 70mm. I shoot around F 3.5-5.6 when outdoors and works great. I was wondering, what size friction arms would you recommend? I like the 11″ ones. Thanks again for this video, I will make a video after I use this setup for awhile. What a fantastically simple solution. Nicely done, Caleb. I’d never paid much attention to the friction arms until this video, now after buying one I’ve realised how ridiculously useful they are. Time to buy a few more. Best of all, it’s all I needed to buy to make this rig. Already had a spare Manfrotto 577 adapter/plate, and for a handle I used the one from my Zacuto “iPhone Point ‘n Shoot” which has a 1/4 20″ female thread on the base. Easy peasy! Does anyone have ideas on places to put an external mic for cinematography since the handle would probably make it difficult to attach it onto the shoe mount ???? I just bought the Express35 handle in order to build this and you’re absolutely right…it’s different than the one that Caleb used. It’s too bad…my $60 handle isn’t going to work as I’d hoped. The friction arm has to bend around in order to attach to the handle. It certainly doesn’t screw directly up into the handle. Caleb, you might consider adding an update/warning to this post to warn about the new Express35 handle design. I was I had gone for the Cinevate one now. I just bought the express35 handle and it WAS different than the one that Caleb showed…he must have had an older model. This one doesn’t attach from underneath. Rather it only has threads on the rear/underside of the handle. The 1/4 hole in the front of the handle doesn’t have any threads on it. It doesn’t really work as I’d hoped…I wouldn’t recommend buying it. Perhaps Caleb should update this post with a caveat. 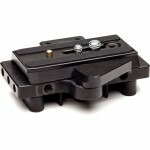 Would either of the above mentioned base plates fit a Manfrotto 804RC2 tripod head? Awesome set up! I’ve been trolling the net for a few days and everyones rig just seems so excessive. This is absolutely perfect! I made the mistake of purchasing this product. Doesn’t match. Very well made though. I’m getting a $10 difference between the monfrotto knock of and the original monfrotto quick release. Are these two plates pretty much the same? Yes they are pretty much identical. I’d save the 10 bucks. Especially if you are going to buy a few. The “plate” will not block the battery door. (if you use the Manfrotto one anyway) But you will need to pop it off the Cinevate quick release dock to open the door…. Sorry I take that back. this is true of the manfrotto dock but looking at the Cinevate one it might be possible to change the battery without taking the camera off I don’t know. Just an idea: Could you attach another Manfrotto or Manfrotto style plate underneath the one unsing another plate? Maybe the other way round to have some friction arm on the other side. Of course this will add some height, but i thought of a setup where you could have the FF on the lower plate to be able to realize this awesome setup you did with the FF AND the handle. My question before I build this rig: Is this thing sturdy enough to take some abuse and do the threaded connections or joints ever loosen and slip during use and ruin a shot? 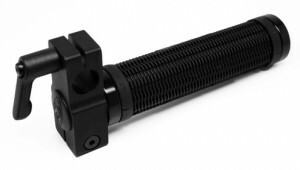 Has anyone found a way to modify the friction adjustable arm so as to make it a bit more ergonomic when using it as a left-side grip? Perhaps putting some sort of rubberized material around the bare metal? Can you get a 1/4-20 coupling to face the Cinevate handle the correct way? Caleb, Can you do a video on your setup for the show? I personally don’t like the “Gun-like” handles. The gun-like handles can limit you, you can only hold it in the direction the handle is facing. On the Ikan handle, it is more spherical which means you can hold it from many different sides. Unlike the pistol-styled grip the ikan handle is more round so you can hold from many different angles. The cinevate handle only lets you hold it in the way it is facing. In the photo is has a male 1/4-20 screw that can be removed. Under that male 1/4-20 screw attachment is a female 1/4-20 hole to mount the friction arm into. If you look at the more images section, it shows how it is set up. Would I be able to use different base plates and a cheese plate underneath to add accessories? Also how comfortable is this to use compared to other cages? I found this very ingenuitive, but unless you have these parts lying around its almost cheaper to buy a dedicated rig handle from B&H for about 28 bucks. @calebpike:disqus whats on the tip ring of the lens? a gear? makes your lens look dope! You’ve been posting links to that site all over my blog. Please don’t self promote excessively. Hey there Caleb, thanks for the great idea for a low-rider rig, really liking this. Since Calumet went out of business that plate they make is out of stock, probably forever. I’ve been poking around and haven’t been able to find an alternative to the Cinevate plate which while awesome, I’d rather not have to plunk down $200 for. Any alternatives that you’ve seen recently?